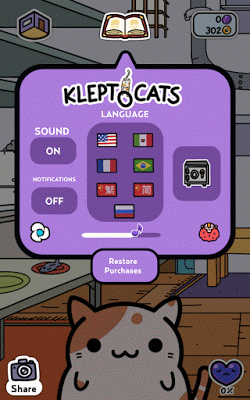 Kleptocats borrows the kitty collector theme from Neko Atsume and presents a unique game full of cats and mementos. Instead of watching cats play with toys from a distance, you get to interact with your feline friends by petting and feeding them. In return they travel far and wide only to bring back items to express their gratitude. Now from where do they get those items is a mystery and the game’s title reveals the secret. But as long as they pour their hearts out with those little gifts, no player will mind such cat burglary. The sequel to this epic cat collector promises more fun and plenty of secrets. You will have to improve your pet cat’s mood by raising the mood meter at the top-left corner of the screen. The more it fills up, the happier your cat gets. A happy cat will bring unique items and coins, so raise the mood meter to 100 percent if you want rare items for your room. 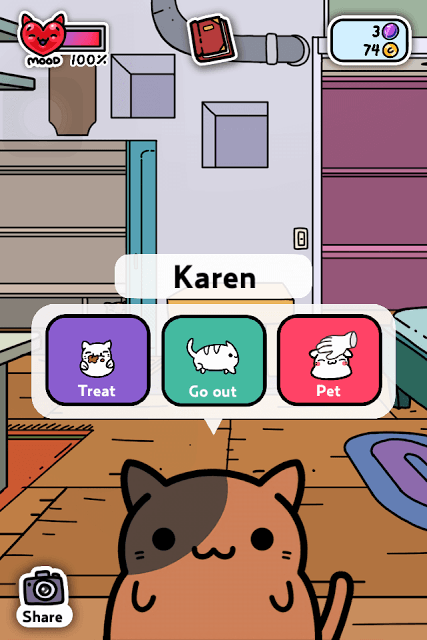 Tap your pet kitty to bring up three actions: Treat, Go Out and Pet. Tapping on Treat will give you a fish. You will need to press and drag the fish to your kitty’s mouth to feed him/her. Each bite will add 2 points to the meter. Selecting “Pet’ will let you raise your cat’s mood by petting your kitty. Tap on your cat’s forehead to pet him. Each pet will increase the mood meter by 2 points. Tapping his forehead rapidly will fill the happy meter faster. 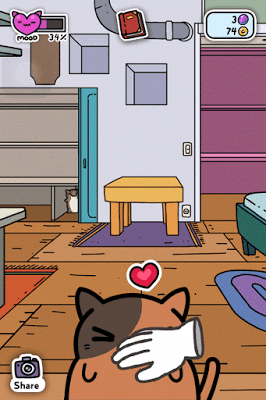 When the meter rises above 50 percent, the tiny heart icon beside it smiles slightly, indicating the cat is in a cheerful mood. Tap on your cat once again and press “Go Out”. After a few seconds, your cat will come back with some coins and a gift for you. Tap on the gift to collect and it will be placed on your room in the background. After collecting a gift and coins, the happy meter falls back to 0 percent. You will have to make your kitty happy again if you want him to fetch some gifts and coins for you. At first, your cat will take a few seconds to go out and bring a gift for you. But as you progress, your cat will take more time in bringing gifts and toys. You can close your app, do some other work and wait for the app to notify you about your cat’s arrival or play a mini paw bursting game. Open the game and keep tapping on paws. When you tap 10 paws you will receive a coin. Sometimes a coin also appears along with paws. Keep tapping on paws to earn some bonus coins. Inventory: Shows the number of items your cat brought for you. 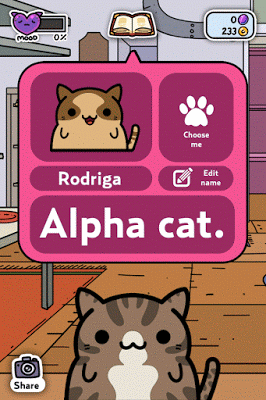 Cat-alog: Shows cats that you have purchased so far. Bonus coins for Video. Watch a video to earn 50 bonus coins. Grays out sometimes, but when it’s active just tap on it, watch a 30 second video and get 50 coins. This option lets you purchase a cat. You will need at least 4 purple gems to buy a cat. In rare occasions, your feline friend will bring those gems. However, if you want them quick, you can exchange coins for them. You will need to spend 250 coins to get a purple gem. You can also exchange a gem for 125 coins. 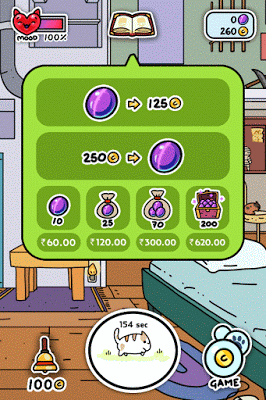 To Exchange coins for gems, go to “Shop”. It lets you get access to different types of accessories and items for your kitties. This includes cute headgear, eye masks and specs, colorful bows and ties. Each accessory costs some coins. Inside you will see a list of rewards you will get each day. Login daily to play this game. You will get purple gems on the 4th, 8th, 12th and 16th day. You may have noticed your kitty bringing pieces of orange colored stickies with him. Well they are pieces of a larger puzzle and once the jigsaw is complete, you might get a bonus cat. I am still not certain, but just collect them and see. You can see the stickies arranged in a tiny cupboard in your room (just behind the toy mummy). You can get extra gems from a secret safe, but for that you will have to search for clues in your room. These cryptic clues are usually pictorial in nature and sometimes your collected cats may have a clue for you. Just crack the code and enter the word(s) (without spaces) on the box that appears after tapping the secret safe. Here’s how you can access the safe. You will see a secret safe icon. Tap it and enter the code. To get the secret safe, make sure you have updated the app. Petting a cat is a faster way to reach 100 percent happiness. Tap rapidly on a cat’s forehead to fill the meter quickly. Feeding fish to your feline friend is a fun way to interact with him, but you will be able to fill his happiness meter very slowly. On Android, I couldn’t find a way to save game progress. Hope HyperBeard games will add this feature later so that players can save their game progress and play on multiple deices. Until then, players can use the Helium app to save and transfer game data. Getting them from your cat after sending him for a walk. Playing the tap-a-paw mini-game when your cat goes out for a stroll. For every 10 paws you tap, you get one coin. Keep tapping rapidly whenever you see paws. Tapping rapidly on a golden cat. The golden cat appears randomly and you will have to search your room to find it. Tap it quickly to get lots of coins. Earning them via Daily Rewards. Login daily to get coins. Each day, the count goes up by 10 coins. So if you get 10 coins on day 1, you will get 20 coins on day 2, 30 on day 3 etc. On day 15, you will receive 150 coins. Watching an advert. The advertisement offer usually appears after tapping “Go Out”. It might also appear in the middle of the mini-game. You get 50 coins for watching an advert. You can access this offer by accessing album. You can use coins to bring your kitty home instantly. You will have to spend 100 coins to ring a bell and your cat will come home with a souvenir and some coins. However, I would recommend saving coins for gems if you want more kitties. One gem costs around 250 crystals and you will need at least 1000 coins to get four gems. As you progress, it will take time for your cat to come back home every time you send him out. Instead of using the bell, why don’t you spend some time playing the mini-game? This way you will earn some coins. And if you are bored, you can just close the app and come back later to check how many seconds are still left and then play the mini-game again to pass your time. You should aim for a 100 percent happy meter to get unique items. If you allow your cat to go out with a happy meter of 50 percent or above, chances of getting duplicate items are more. However, I noticed that 100 percent happiness does not guarantee more coins. I sent my cat outside at 60 percent happiness and he brought more coins than at 100 percent. But yes, I got a duplicate item.